The World Wide Web has created a number of possibilities in the way content is delivered to computer users. On the Web, we are able to manipulate text, images, video and audio which opens a number of possibilities in how we receive and send information. The chess world has been tremendously aided by this development. In days gone by, one had to rely on printed media which could be dated by the time it is received. 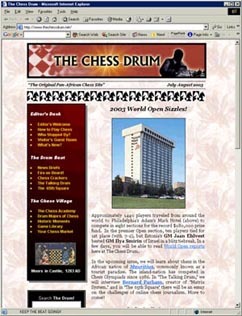 Today, chess websites allow the user to print, download, view, and listen to rich content . Interactivity has become the new buzzword in this arena. What does it take to build and maintain and functional chess website? Is it merely putting a few pages up on a network server and hoping that chess players will stop by? All webmasters will give a different account of their strategic outlook for building an audience, but word of mouth or "viral effect" is crucial in building awareness. In addition, there are at least three major issues that webmasters should ponder: creating a niche, developing an appropriate interface and maintaining journalistic integrity. When talking to my e-Business students about online business development, I tell them to think of a product or a service that creates value. Each individual has basic needs and wants that require fulfillment. For chess players, it may be either playing chess online, reading the latest tournament news, playing over games, or chatting with a player half-way across the world. To a chess player, these activities have some inherent value, so the creator must create a value proposition. In conceiving the idea for a Black chess publication years ago, I discovered that there was a demand for this information. There was no single source that provided this type of information. Every now and then there would be a story in the chess media about an accomplishment. Mainstream chess publications (and websites) typically cover the same select group of players, so there are many stories not being told. In the next 20 years, we will see many special-interest niche publications when India and China become dominating chess powers. Once you have a well-defined niche, create a mission statement so the focus is maintained. One of the challenges in creating a niche is to build something that chess players will value over the long term. Even if it is unoriginal, it should provide a value that the other sites do not provide. The challenge is to keep the focus tight. A webmaster will hear many suggestions about adding certain features, but must resist being all things to all players. There are hundreds of websites that deliver some form of chess content. The challenging question is, "How will your site differ in its design and deliverance of content?" Chess. FM has created a veritable niche in the area of online audio content and has been widely successful. Its unique format is refreshing and adds a human voice to the Web. This impact would not be as great on regular radio due to its lack of interactive content. Despite the fact that the Web is a content-rich medium, there is a need to design a friendly interface. What good is rich content if it's difficult to find? As a webmaster and journalist, one has to decide who the audience is and put themselves into that mindset. One of the toughest challenges is to increase a site's "stickiness," or the length of time visitors remain at the site. The sites that are the stickiest tend to provide rich content whether in the form of playable games, downloads, game servers, or merely reading the latest chess news. The Chess Drum exceeds 2700 pages so search engines and link bars are crucial in the visitor's ability to traverse the site. In addition, numerous forms and well-placed contact information help spur interactivity. As mentioned earlier, interactivity is one advantage the Web has. Part of the journalistic credo is to ensure the ethical integrity of the information that is being presented (see CJA's Code of Ethics). One of the major challenges in online journalism is creating credible and accurate information. In the print world, media organizations have "fact-checkers" who go through every single fact to ensure accuracy of the article content. While working a brief stint for Sports Illustrated in New York, I had the unenviable task of fact-checking statistics in the stories. The work was tedious, but ensured quality control. One area of conflict that often arises is citing other's work. How does one provide proper citations? In many cases it is not possible to know who took a particular photo on a site, but if this information is available, it should be noted. Webmasters generally have an unspoken agreement on the use of images, but sometimes this privilege is abused. For example, cropping of images is certainly acceptable in most cases, but to make changes without permission (e.g., airbrushing) is unacceptable and journalistically speaking… unethical! Online chess journalism is challenging. Being able to "get the scoop" means logging onto the Internet Chess Club (ICC), relying on tips, traveling to tournaments and spending untold hours scouring the Web for morsels of information. For me, finding information about Black chess players is exceedingly difficult so it's important to enlist the help of others who may spot a story. Of course, accuracy of these reports must be checked and the editor and/or webmaster must make tough calls on whether to run a story that may cause a bit of controversy. Regardless of the quality control, there are still a number of issues. In a brief conversation with IM William Paschall (commentator at Chess.FM), we agreed that "you can't please everybody." Of course, what's important is whether the target audience is pleased.